The Lagos State Government, in furtherance of its commitment to boost tourism, celebrated Easter with the 2018 Lagos Boat Regatta organised by the Ministry of Tourism, Arts and Culture at the Lagoon Waterfront on Oyinkan Abayomi Drive, Ikoyi over the weekend. The festival, usually celebrated by the traditional coastline communities in the State, is a cultural and entertainment funfair highlighting the State’s aquatic treasures and promoting the relevance of the custom and tradition of the riverine dwellers. Addressing the gathering at the event, Lagos State Governor, represented by his Deputy, Dr. Oluranti Adebule stated that the colourful parade on water has been a consistent feature of the State’s entertainment for many years. According to her, ”our coastal asset is our strength, we must pursue all available ideas to develop it and encourage stakeholders in the marine and hospitality business to leverage on the many possibilities provided by our waterways”. She disclosed that having simultaneously held the event in different locations to celebrate the State’s golden jubilee anniversary, the success of its experience has reassured the State of the treasure its waterways represent and gives reasons for the State to nurture it for tourism. “We have made a modest and significant investment in the water transportation through the acquisition of world-class ferries and jetties”, the Deputy Governor noted. She informed that, presently, there is a growing interest in surfing and Lagos waterways are acknowledged as one of the best in Scuba diving in the world, adding that the State government will not relent in making the waterways cleaner and safer for optimal use. The Deputy Governor assured Lagosians that the government would promote initiatives that will strengthen the exploit of waterways to attract local and foreign partnership for productive investments. Also speaking at the event, the Commissioner for Tourism, Arts and Culture, Mr. Steve Ayorinde, said the event reflects the possibilities available on Lagos waterways and it is amazing to see how Lagos has transformed to a vibrant home of entertainment and tourism. He said events of this nature give the State an avenue to collaborate with the private sector in showcasing to the world the beauty inherent in our waterways. Ayorinde pointed out that creating an immediate experience and opportunities for people to appreciate the coastal region of the State emboldens the prosperity of the State’s economy. ”Investment in waterways is rewarding anywhere in the world and this vision is what Governor Ambode is vigorously pursuing since the State is blessed with beautiful waterscape and experts in the field”, he emphasised. 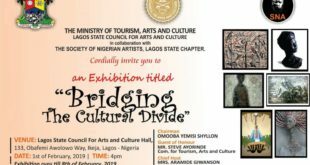 Aside the Special Adviser to the Governor on Arts and Culture, Mrs. Aramide Giwanson, other dignitaries that graced the occasion include the Oba of Lagos, Oba Riliwan Akiolu, former Deputy Governors of the State, Alhaja Sinatu Ojikutu and Mr. Femi Pedro, Lagos State Head of Service, Mrs. Folasade Adesoye and the Permanent Secretary, Ministry of Tourism, Arts and Culture, Mr. Fola Adeyemi among other government functionaries.